The Telehandler is a machine widely used. 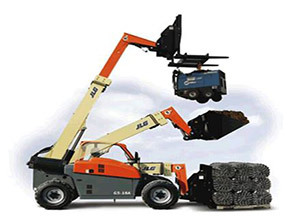 It is similar in appearance and function to a forklift, but with the increased versatility of a single telescopic boom that can extend forward and upward from the vehicle. On the end of the boom the operator can fit one of several attachments, such as a bucket or forks. Copyright © 2013-2015, Bonaire Telehandler Company, all rights reserved. Web site hosted and designed by NetTech, NV.